Although the summer is one of the best seasons to take advantage of your personal outdoor oasis, there’s something that’s inexplicably refreshing when that slight hint of cool air appears after a long spell of hot days. Just like everything else, the needs of your pool will slightly change as we head into the zone of cooler weather. To ensure that you are ready to make the most of one of the best seasons of the year, here is what you should be aware of to take advantage of the pleasant autumn environment. Using a long-handled skimmer or vacuum, be sure to capture floating debris and organic matter to prevent staining or clogging of your filter system. There’s a huge uptick in leaves when all of your backyard trees start to shed their leaves so plan to set aside time to devote to this task, especially when your pool is still open. Before the cold weather sets in you should remove all of the accessories from your pool including the pump and filter baskets. Dry them out and store then safely in a dry location for the winter months. You don’t need to do this until the temperature significantly drops but you should be aware of the task and watch the weather! 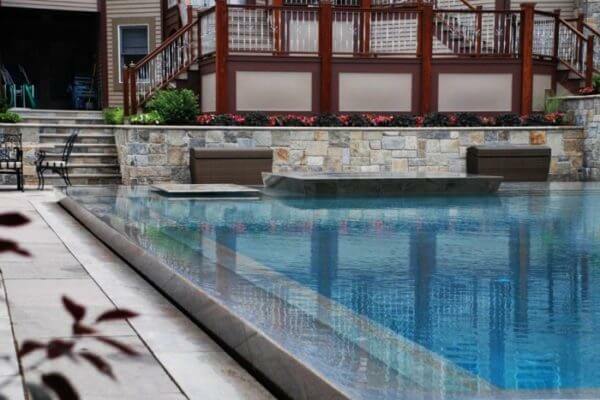 When it comes time to winterize your pool. you will need to reduce the amount of water to about 18-24 inches below the normal skimmer level. Solar blankets are other great options to help keep your water temperatures up to prolong the use of your pool into fall. By retaining daytime heat from the sun and using it to heat your waters, solar blankets and pool covers can help you stay outdoors and in your water longer!